Betts, Charles Wyllys (1845-1887), Lawyer, Die Sinker, Coiner of Imitation Coins, Numismatist, Author. He was born on August 13, 1845, at Newburgh-on-the Hudson, Orange County, New York, the son of Judge Frederic Joel Betts (1803-1879) and Mary Ward Scoville (1813-1868). In 1855, his family moved to New Haven, Connecticut. He and his older brother Frederic attended school preparing them for Yale where their father intended them to study law. In July 1861, just before the outbreak of the Civil War, he was forced to leave school due to an illness. During his convalescence he began to collect coins as it was suggested to him for recreation. Since numismatics was suggested it probably meant that he was given to read on this subject. Contemporary with young Betts was the numismatic author, William Cowper Prime (1825-1905). In 1860, Prime published two articles in Harper’s New Monthly Magazine; first, “Coins and Coinage,” in January; and “Coins in America,” February. The following year he published, Medals, and Seals, Ancient and Modern. Illustrated and Described... (New York: Harper & Brothers, 1861). Betts interest in coins was soon merged with his homeschooling lessons of early American history and his studies in the art of engraving. About half a dozen were struck in lead and one in copper. The later is in the Yale College collection, and is a very good impression. The die is altered to 1861. My next attempt at coinage was a leaden token with the inscription, “Colony of New Yorke,” the latter words being on the obverse surrounding a head. One of these tokens I sent to Mr. Mickley of Philadelphia. The dies were cut upon coins of the halfpenny size, either worn smooth, or filed away on one side. My only tool was an awl for cutting the letters and the outlines of the figures, and a knife for gouging out the broader parts of the designs. When the cutting was finished each die was heated white hot and dipped into cold water. A third smooth cooper of the halfpenny size was then heated and placed between the dies, and the three being quickly rolled together in sheet lead from a tea box, to prevent them from slipping, were pounded upon an anvil with a six-pound dumbbell. The heating process gave an air of antiquity to the pieces. Unfortunately, someone, about 1862, presented me with a set of letters (i.e., punches) and several engraving tools and in learning the use of them I made a great number of store cards and medalets, most of which are unique, and all, I think, in the Yale College collection. All of this mishap could have been avoided had these coin collectors kept abreast of the numismatic literature circulating in their day. It had been widely known through the efforts of William Elliot Woodward (1825-1892), a coin dealer from Roxbury, Massachusetts, and one of the earliest full-time coin dealers in the country, in his 9th coin auction sale, to the keen collector as early as mid 1864 that Betts produced fabrications of many coins. 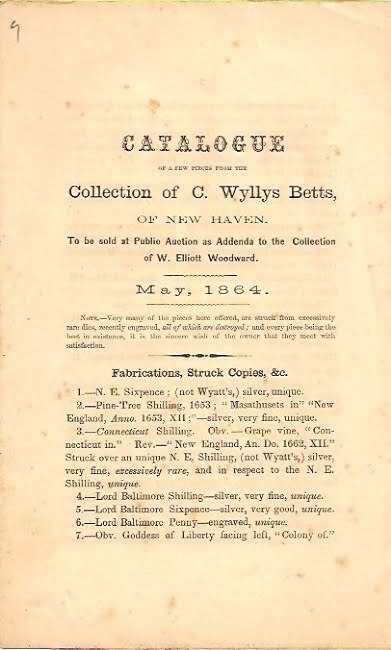 On May 17-20, 1864, W. Elliot Woodward published an addenda to this catalog of coins, medals and tokens belonging to John F. McCoy to be sold at auction by Leavitt, New York, containing a list of 45 fabrications and struck copies of coins and medals from Betts’ coin collection. [See Figure 1.] Had coin collectors kept abreast of this 9th Woodward sale and the notices published in The Coin Collector’s Journal and in Numisma by Edouard Frossard in 1877 and 1878-1879 respectively their sense of loss could have been avoided. Besides his own creations of fictitious colonial coins and medals Betts would hunt for genuine specimens by scouring the vicinity of New Haven on coin hunting expeditions, making inquiries and various purchases in order to build his collection for numismatic study and amusement. On one hunting occasion he called upon the hardware store of Broome and Platt on Chapel Street, who had in their possession purported unused original dies for the Fugio Cent, which Betts informed a Mr. Root in New York who subsequently purchased them for $10.00. Contemporary numismatic historians rightly challenge the claim by Betts that these were authentic dies mainly due to the differences in design style, details and execution. They cite, for example, the three sets of Fugio dies purchased by Horatio Nelson Rust (1828-1906), a coin collector at Chicago, Illinois. In 1858, Rust purchased one die only from Bridgeport, and at some unknown and uncertain time later on, five others from the hardware store of Broome and Platt, New Haven. It seems reasonable that the Scovill Manufacturing Company at Waterbury, Connecticut, produced at least four sets of dies sometime between 1856 and 1857, coinciding with, and perhaps prompted by, the change in United States copper cents, and for some reason not yet discovered from original documents explaining the very reason why these dies were created. Apparently, whatever the causes were the project fell through and Rust acquired over some uncertain period of time between 1858-1872, the remaining parts of the three sets that had been scattered.Whereas, it is certain that Root purchased the one set of dies no earlier than late summer of 1861 and probably no later than early 1862, at the very same hardware store where Rust also found the five dies either before him or after him. It is tenable that Betts found the first complete set, which Root purchased. After selling it to a Mr. Root in New York about 1861 or 1862, the news could have reached Rust sometime thereafter and upon hearing about it went to the store of Broome and Platt and purchased the five dies they found subsequent to Betts visit there. If this is correct then by the time Rust went to find the remaining pieces Betts would have been long gone and away from numismatics having sold his medal collection and fabrications and was unavailable, and perhaps disinterested, while studying at school. On June 11, 1863, he sold his modest collection of thirty medals through William Harvey Strobridge in an addendum to the sale of theLate Hon. Henry Augustus Muhlenberg, Esq [1823-1854] that was held beginning June 9,1863, at the auction house of Bangs, Merwin & Co., Irving Building, 594 and 596 Broadway, New York City, New York. He was putting numismatics aside as he entered Yale College in 1863, and as we have already seen sold 45 fabrication coins and medals in 1864 through Woodward. Regardless, he graduated Yale College in 1867, and won prizes for excellence in literature composition. In 1869, he graduated Columbia Law School, New York City, New York, and was admitted to the bar. In 1871, he completed post-graduate studies at Yale University. Consequently, from 1863 to 1871 Betts was assiduously busy with studies at school and had no time to devote to numismatics. After graduation he entered the law office of Whitney & Betts, i.e., his elder brother Frederic H. Betts. In 1875, the Betts brothers formed their own law office F.H & C. W. Betts, which in 1878 became Betts, Atterbury & Betts, where he continued practicing law up until his death. He married in 1879 and his wife died in 1880. Correspondence to Mrs. Charles Wyllys Betts, November 1879 February 1880, at their home at 361 West 23rd Street, New York, New York, are in the Reginald Allen Collection in the Gilbert and Sullivan Collection, Pierpont Morgan Library Museum, New York City, New York. The letters were written when Sir Arthur Seymour Sullivan (1842-1900), was visiting in New York. In 1880 he was living with his brother Frederick at 78 Irving Place, New York City, New York. Correspondence to Betts from June 18, 1883 to May 1, 1886 is in Reginald Allen Collection in the Gilbert and Sullivan Collection, Pierpont Morgan Library Museum, New York City, New York. In the spring of 1884 he resumed coin collecting and soon became a resident member of the ANS. In April 1886, he gave an address to the ANS, “Counterfeit Half Pence Current in the American Colonies and their Issue from the Mints of Connecticut and Vermont,” which was printed by request of the Society and distributed since it was a landmark paper and forms the foundation on all subsequent research of American colonial counterfeiting 1785-1788. Nearly three-quarters of a century later this essay was so highly regarded as precious that George Fuld and Robert Vlack reprinted it again early in 1960. A second reprinting was done by Jim Spilman in the June 1981 issue of The Colonial Newsletter, but with corrections and additions that aid the reader in identifying specimens by Vlack, Bressett and Barnsley/Miller attributions. He was a specialist of Admiral Vernon Medals, and cataloged and described 167 varieties. His opus magnus, American Colonial History Illustrated by Contemporary Medals, was left unfinished by his sudden and unexpected death. It was completed by his brother Frederic Henry Betts, William Sumner Appleton, Lyman Haynes Low, and William Theophilus Rogers Marvin, and published posthumously in 1894, seven years after his demise. In May 1886, he left for a trip to Europe and visited the British Museum, London, and the Paris Mint in order to do research for his manuscript, American Colonial History Illustrated by Contemporary Medals. He died less than a year later. In November 1886 he corresponded with Steuben Jenkins about an Indian medal, Betts 164. One letter of correspondence together with Betts' rubbings and sketch are in the Lupia Numismatic Library and were published in the Medal Collectors of America (MCA) Advisory. It was on a Wednesday, April 27, 1887, that he died of pneumonia at his brother Frederic’s home at 78 Irving Place, New York City, New York. He was surrounded by his brother's family : his sister-in-law Louise, two nephews, Frederic, Jr and Wyllys, and his niece Mary Betts. In 2009 the Numismatic Bibliomania Society conducted a survey of the 100 Greatest Items of United States Numismatic Literature and placed American Colonial History Illustrated by Contemporary Medals as No. 13 on the list. Gengerke, Martin, American Numismatic Auctions, 8th edition (1990) : 10;. Mason’s Coin Collectors’ Herald, Vol. I, No. 2, September (1879) : 15d (1802 half dime). This letter of Betts was appended to an article by Ed Frossard. See Edouard Frossard, “Fabrication,” Numisma, Vol. 2, No. 2, March (1878). See also it reprinted by Don Taxay, Counterfeit, Mis-Struck and Unofficial U.S. Coins (New York, New York : Arco Publishing, 1963) : 144-145. Note that Betts writing about this17 years later asserts he began coin collecting, but more importantly paints a portrait of himself as one of the earliest coin dealers in the country in 1860, perhaps, vying for prominence as a young dealer with his contemporary Henry Chapman who began dealing at the same age, whereas, his obituary published in 1887 refers to it as beginning about July 1861. Curiously, even Betts who avers the earliest medal he struck bears the date 1860 as his coin dealership store card and claims it was altered to read 1861. Further, he contradicts himself boasting how good the impression of his first medal was struck in copper, dated 1860, and continues giving the account of how long it took him to do this in copper no earlier than 1861 and received die punches in 1862. Neither the identity of Root has ever been resolved, nor the answer to why Betts would immediately contact him to purchase the dies. Root seems to be someone who can mint coins from dies rather than a specialist on colonial coins. There was a Charles Root (b. 1821), a master tinsmith, living at Newburgh, New York in 1860; John B. Root (b. 1830), owned an iron foundry at Port Chester, Rye, New York. Sylvester Sage Crosby asserted in 1875 that the dies were found at the store formerly occupied by Broome and Platt at New Haven. See, Sylvester Sage Crosby, “The First Coins of the United States,” American Journal of Numismatics, Vol. 10, No. 1, July (1875) : 3. Eric P. Newman believes the New Haven dies were produced circa 1859 by the Scovill Manufacturing Company, Waterbury, Connecticut. If this is correct, which I also believe, then the dies sold to Betts were only about two to five years old and Broome and Platt must have known they were contemporary replicas, not original antique dies. See Heritage Auction Galleries, October 2008, Dallas, Texas, Signature Coin Auction Sale, Lot. 29. Moreover, if this view is correct then the coins struck by these dies are not restrikes but replicas, also called copies or struck copies.